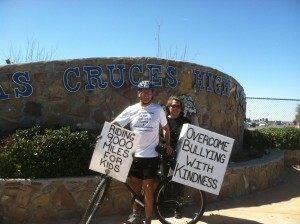 On my ride to the New Mexico State University campus, I met with Assistant Principal Lorraine Paz of Las Cruces High School. She and I talked about the importance of all of us having an awareness of issues students have to deal with on a day to day basis. In a bad situation, even a good kid can change quickly and the importance for a parent to watch over their children is especially important from 5th grade on. “That’s when the fun begins,” I’ve heard countless times from educators. I love talking with kids of all ages about the two issues I am riding for. Conversation is healthy. Two very important things happen. One, education about the issues being discussed takes place, and two, healing takes place for the individual. Keeping issues bottled up inside does no one any good. This entry was posted on Thursday, March 14th, 2013 at 8:21 am	and is filed under Kindness. You can follow any responses to this entry through the RSS 2.0 feed. You can leave a response, or trackback from your own site.